Your Strategy for 2014: Steady Growth, Invest to Accelerate or Cut Costs? Businesses confidence has been rising steadily during 2013. But while many company bosses I’ve spoken to are banking on growth in 2014, there’s a potential cloud on the horizon. According to a survey I came across in CEB Finance Daily, some two thirds of company bosses are also planning to cut costs to increase their margins in 2014. While this may be unavoidable for some public companies and others with aggressive external investors, it would be close to suicide for others, especially SMEs. We are at a point in the economic cycle where investing to take advantage of the velocity in the market is almost guaranteed to deliver success, whereas holding back and doing nothing runs the risk of killing, or at least injuring, a company as more nimble competitors steal the lead. Established businesses need to realise that many new competitors have emerged over the past three years with different, leaner, more flexible business models that make them lower-cost and fleeter-of-foot. Many businesses have become so conditioned to cost-cutting that they automatically say ‘no’ to spending new money and often continually try to reduce their expenditure. In effect, their focus is on efficiency – spending less and hoping to get the same – whereas it now needs to be on investing in growth and taking advantage of the opportunities a more buoyant market will deliver. Cost-cutting is at best a tactic for surviving and should never be confused with a strategy for thriving. So perhaps there has never been a better time to consider the meaning behind “If you keep doing what you have always done you will keep getting what you have always got” or, more likely you will progressively get even less. One useful tool to help you break out of this rut is the Ansoff model, which is a disciplined foundation for the process of thinking required to explore your options. 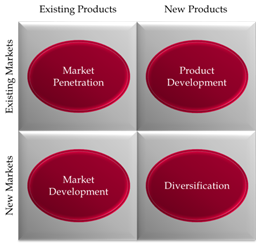 A business can of be positioned anywhere on this matrix and may well be in several quadrants at the same time, but there are effectively four main positions as defined by the quadrants. 1. Established offering to established markets. On the face of it this is the most predictable and lowest risk option. However, doing nothing brings its own risks such as; slowing growth through market saturation for your offering, commoditisation leading to downward pressure on margins and the risk from new agile competitors. Surveys typically show this option being the major source of revenue for most companies with the average across all industries and types and sizes of businesses being some 88% of total revenue coming from this source. This percentage typically gets higher during times of economic strife. If the preferred option is to keep doing the same things then a useful tool enabling a rational review and analysis of the current position is the Boston Matrix (illustrated here). 2. New offering to established markets. This has the obvious benefit that the market is known and the established customers within that market will to some extent be sympathetic towards an established and valued supplier. Hence approaching established markets and customers with a new offering is the least risky option for trying something new. Established customers will be easier to sell to than new prospects and will probably be more forgiving if there are issues with the new offering but may well extract special terms as they are functioning as guinea pigs. 3. Established offering to new markets. As this is your established offering, there is little risk from this side of the equation as you know the current strengths and weaknesses and have plenty of experience of selling and delivering to your established markets. So, the main risk comes from a potential lack of understanding of the workings of the new market so initial assumptions, goals and targets will need to be reviewed regularly whilst learning the new market and how your offering now fits. 4. New offering to new markets. A new offering could be the result of you developing something new or you taking on an agency or re-seller arrangement for a new solution. If it is something you have developed then although new in terms of a proposition to market you have the knowledge and experience gained from developing it. If the new offering is something you have taken on then your knowledge of the offering is at its weakest compared to all the other scenarios. So, a new offering to new market is usually the highest risk but can also offer the highest rewards. 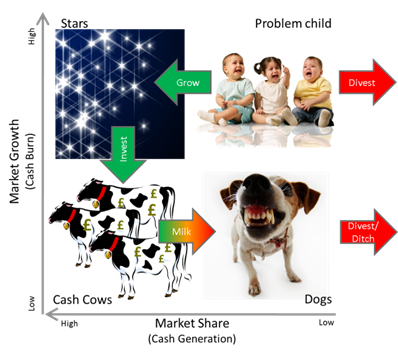 No one can answer this question for you but I would recommend you initiate a project with the specific aim to explore the questions; what should I be selling, to whom, at what price, how much and by when? The project needs to have the brief and authority to address the questions and provide specific answers including; timescales, budgetary requirements, risk assessment and forecast returns. You might find it helps to involve your trusted advisors and possibly to involve external specialists where you have a gap in your knowledge, for example, if you are considering franchising as a route to market it would be advisable to seek input from those who already use this model. Remember, not all competitors are enemies and when handled carefully they can be a useful source of real information about the market. Posted in: Growth, strategy planning.